John Boyega is Jake Pentecost in Pacific Rim Uprising. The crux of Pacific Rim Uprising is how it handles the idea that sequels always need to be bigger. Being a sequel, the expectation is that it should include more robots, larger monsters, and more expansive set pieces. Those are certainly all in there, but at the same time, the movie is so focused on its two main characters that it also somehow feels... small. 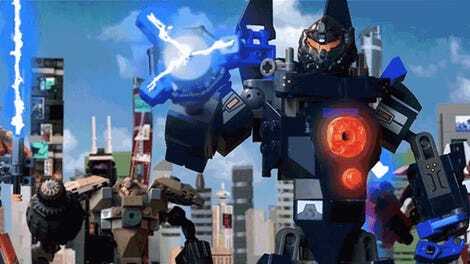 Directed by Steven S. DeKnight, Pacific Rim Uprising sets its tone by introducing Jake Pentecost (John Boyega), who explains how the events of the first film changed the world. Not in terms of the planet, but in a street-level way, as Jake’s life is about stealing, partying, and working on the black market. Soon after, he meets a young girl named Amara (Cailee Spaeny) who has her own special project in the works and the two form a reluctant friendship. 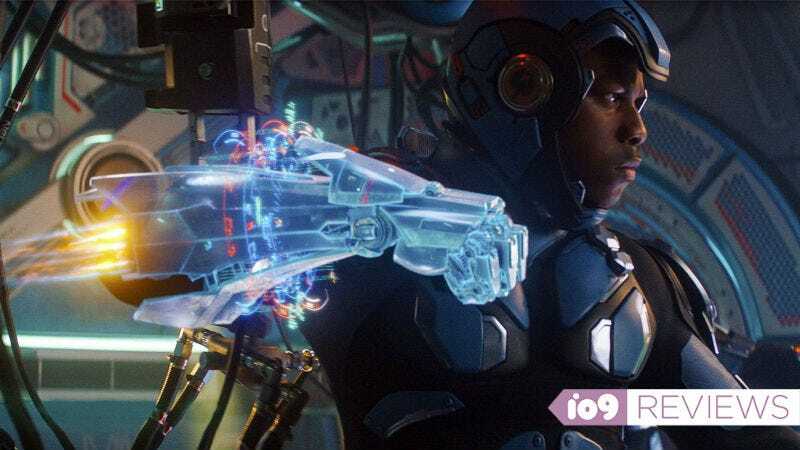 By starting the film focused on these two characters, Pacific Rim Uprising instantly connects its audience to something that feels more real than the original. The monstrous Kaiju that attack the world, the Jaegers humans built to fight them—we see how these things have real consequences on real people. 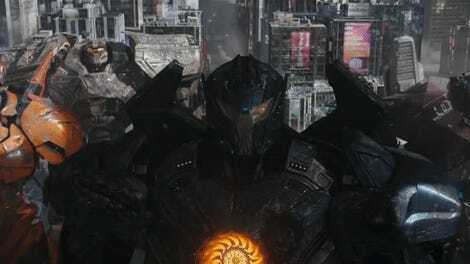 It’s a new perspective in the world of Pacific Rim, and it’s a nice, and very surprising, touch. Once Jake and Amara get to a cadet academy to train as Jaeger pilots, they join a new generation of pilots and those introductions bring a fresh, reboot-esque feeling to the whole thing, which also gives the movie a bit of substance. From there, the epic part begins: There’s a new global threat and there are more Jaegers tasked with saving the world against bigger Kaiju in a plot that has a nice little twist. This is a sequel, after all. Cailee Spaeny and John Boyega are the new heroes of the apocalypse. However, all those big action scenes, the ones audiences are going to pay to see, simply don’t have the flair or impact you’d expect. The first Kaiju attack is unique and fun but after that, virtually all the rest of them feel incredibly similar to diminishing returns. 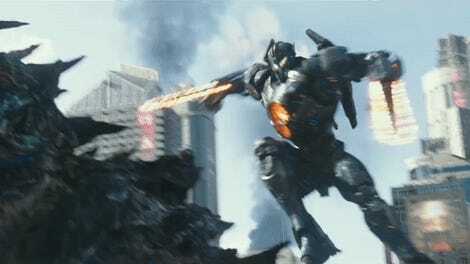 After showing off all the new Jaegar powers and attacks, the fights become a series of robots punching things and getting busted into buildings, over and over again. The scenes may technically be bigger in scope, but the repetition and lack of creativity make them feel... reduced from the original. And it shouldn’t. It really shouldn’t. It also doesn’t help that outside of Boyega and Spaeny’s characters, almost everyone else in the movie feels incredibly disposable. After their introduction at the academy where the film sets them up like they’re going to have dynamic arcs, they don’t, so there’s no particular reason to care about what they’re doing in battle. The one exception, kind of, is Charlie Day’s character Dr. Geiszler, back from the original film, and that’s only cause Day plays him like a coked-out ‘80s character, which is plenty entertaining. But beyond him, Jake, and Amara, there’s almost nothing in the film to get excited about, even when it technically looks more epic than the original. The fact that DeKnight can take a story as big as Pacific Rim Uprising and reign it in is a huge positive. It gives the film a gritty, grounded feeling that distinguishes it just enough from most similar big blockbusters. But he can’t seem to shake that feeling, so even when there are four giant robots fighting a mountain-sized monster for the fate of the entire planet, the stakes never feel more than personal. Ultimately, the real problem with Uprising is that it never truly manages to rise up. Pacific Rim Uprising opens this Friday, March 23.